Being an active participant in our local, state and national government is an important way that we can help protect and enforce our religious freedoms within our schools, promote laws that support a biblical worldview Biblical worldview refers to a person's beliefs about life through which a person interprets the world and interacts with it. A worldview is comprised by the answers to four basic questions (1) Who am I? (2) What is my purpose? (3) What is wrong with the world? (4) What is the solution? As Christians, our worldview is formed by the Bible. Through the Bible we learn that God exists (Heb. 11:6) and that He is the standard by which we measure everything else. God created everything that exists (Gen.1:1) and everything is held together by Him (Col. 1:17). We believe the Bible is God's divinely inspired Word, revealed to mankind (2 Tim. 3:16). We believe that the fullness of God came to earth and lived in the human body of Jesus Christ of Nazareth 2,000 years ago (Col. 1:19). We believe that mankind chose to rebel against God in the Garden of Eden and because of that act of rebellion, sin and death entered the world (Rom. 5:12-14). We believe that believing in (John 3:15-19, 5:24), and obeying (Luke 8:21, John 3:20-21, John 14:21, 23-24), Jesus Christ is the only way to have eternal life or to be reunited with God (Acts 4:10-12). and affect new laws and policies that will impact the public schools. Having a say in the political process is our right as citizens and voters. Without taking advantage of that right, we leave legal matters exclusively in the hands of a secular legal system that often doesn't share our values. Be in prayer for our legislators and government leaders. Be informed about troubling legislation and take action as needed. Build relationships with your local legislators, sharing your opinions, perspectives and concerns. Support large organizations who support our biblical beliefs and have the capacity for large scale impact. Understand our role as Christians in shaping our state's laws and policies. How Compass Can Support You? Engage Christian parents in the law making process and educate them on the role they can play in impacting it. Inform parents on bills in the state legislature (MN House of Representatives and MN Senate) that affect the public schools, and could challenge or oppose our beliefs and rights as Christians. Alert families to controversial bills and policies that require an immediate response and guide them on how to voice their concerns effectively. Guide families on how to contact their local lawmakers. Create "grass roots" opportunities for families to take part in, including letter writing campaigns, calling campaigns or bus trips to the state Capitol. Alert parents to policies by schools or school groups that could oppose our rights and views. Communicating with lawmakers can be foreign and intimidating, but it doesn't have to be. Most welcome feedback from their constituents and feel an obligation to vote according to their constituents' views. Each lawmaker and their assistant are different. Some are incredibly helpful, others are not. Don't be deterred. As a senator's wife once put it, "Remember, you own the place!" As taxpayers, access to our lawmakers is our right and their duty. When issues arise, contacting your lawmakers directly is the best way to be heard. Find your House Representative and Senators on the Capitol at www.gis.leg.mn/OpenLayers/districts/. Each will list their phone number and email, and many include an online form you can use to send a letter. Be respectful ambassadors of Christ. Remember that we have a calling to respect people in offices of authority. Berating emails and phone calls might be ignored for being insulting or fanatical. Lawmaker's assistants ("legislative assistants, or "LAs") screen all emails and phone calls. Communicate in a way that will get your opinion heard by your lawmaker. Be informed. No lawmaker expects you to be an expert, but learn what you can and communicate your specific points of agreement or disagreement. Look up a bill's description and status on the Capitol website http://www.leg.state.mn.us/leg/legis.aspx and research it online. Make your communication as personal as possible. Avoid using form letters or scripts. Handwritten notes are the most affective way to communicate in writing. A visit to the Capitol is by far the most impactful way to communicate. Find out the committees your lawmaker serves on. This can be found on their individual webpage on the Capitol website www.leg.state.mn.us. Whenever possible, meet with your lawmaker in person. Many will meet you in your district or set up an appointment to meet you at their office at the Capitol. 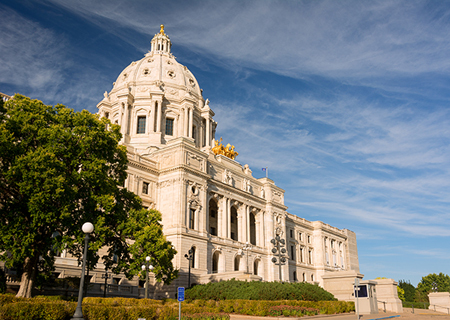 Get a list of "Visiting the Capital FAQ's" at http://www.leg.state.mn.us/leg/faq/faqtoc.aspx?subject=14 for information on parking, tours, maps, etc. Once you find your House Representative and Senator, call or email them to request a meeting. Your request will be handled by a Legislative Assistant (or "LA.") The LA will confirm that you are in the lawmaker's district and ask which bill you would like to talk about and your views on that bill. If your lawmaker is not available for an appointment, still plan to visit. As a taxpayer, you can stop in to visit your lawmaker at any time. Seeing them without an appointment can be difficult, but worth the effort. There is a Historical Society Information desk on the first floor of the Capitol building that can give you maps and explain how to find your lawmaker's office. Often times lawmakers are not in their office and are in voting sessions, "on the floor", or between meetings. Their LA can explain how you can get them "off the floor," by sending them a note while in the session. There are pages who stand at the door outside of the voting floor who can deliver your note for you. Your lawmaker should, but may not always, respond by leaving their session to meet you. Regardless, leave a handwritten note in their office letting them know that you came to the Capitol and what your views are. Go to your lawmakers' website to find out which committees she/he serves on. If you cannot meet with them in their office, or get them "off the floor," you can try to find them as they are leaving or entering a committee meeting. Sometimes, the most time you will get with a lawmaker is in a hallway between their meetings. Whenever you go to the Capitol, leave your lawmaker a handwritten note explaining that you were there and explain your issue. Keep your comments succinct. Always be prepared with a few key points you want to leave your lawmaker with. You may only get a few minutes with a lawmaker so make the time count. Go on the Capitol website to find out when the legislature is in session. Their sessions are typically just a few months of the year, convening in later winter and ending in late spring. The good news is there is an enormous opportunity for Christians to play a larger role in shaping our state's laws and policies. Very few people contact their legislators and share their opinion, so just a few people sharing their perspectives can have a huge impact. There are large, well organized groups who share our beliefs as Christians that we partner with to have an even bigger impact. We need to be aware that there are also large, organized, and well funded groups who oppose our Christian views. These groups can be very vocal and without the engagement of more Christians, can appear to represent the majority and promote their ideals unchallenged. It has never been a more important time as a Christian to be informed and speak out when our freedoms are being threatened. Our prayer at Compass is that we can come alongside you so that you are equipped and empowered to do just that. For more information, contact Compass at compassinfo@compasslink.org. The Minnesota Family Council (MFC) is a Christian advocacy organization whose mission is "to nurture and defend families by restoring biblical truth in our culture." The Alliance Defending Freedom, formerly the Alliance Defense Fund, builds alliances between Christian attorneys and like-minded organizations to protect and defend religious freedom. The Child Protection League Action (CPLAction) is a 501(c)4 nonprofit corporation that is committed to promoting the welfare of children and protecting them from exploitation, indoctrination, and violence. CPLAction educates the public and public officials, lobbies elected lawmakers, and equips its members to impact public policies and legislation toward the physical, mental and emotional safety and welfare of children.